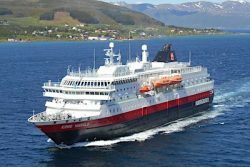 Høglund Marine Solutions of Sem, Norway, has been awarded a contract to deliver biogas-ready fuel gas supply systems (FGSS) for six Hurtigruten passenger ship retrofits. Hurtigruten is a Norwegian cruise, ferry and cargo operator which services the country’s western and northern coast between Bergen and Kirkenes. Peter Morsbach, Project Director, Høglund Gas Solutions, said: “We are tremendously excited to be involved in such a forward-looking project, which will undoubtedly set a new benchmark for low-carbon emissions in the rapidly evolving cruise sector.